Paul Millsap and Gary Harris added 18 points apiece for the Nuggets, who unleashed a torrid offensive display to snap their season-high, four-game losing streak. Jamal Murray, who came off the bench rather than start, had 14 points, as did Trey Lyles. Denver outshot Atlanta 56.4 percent to 34.8 percent from the field and pushed the pace throughout, getting up and down the floor and wearing down the Hawks, who like to run themselves but were also playing at altitude and in the midst of a four-game road trip. Jeremy Lin scored 16 points and Kent Bazemore had 14 in the Hawks’ sixth straight loss. The Nuggets outscored Atlanta 13-0 to start the game en route to a 35-23 advantage after one quarter, when Atlanta missed 13 of its first 21 shots. Denver stretched its lead to 73-57 lead at the half. 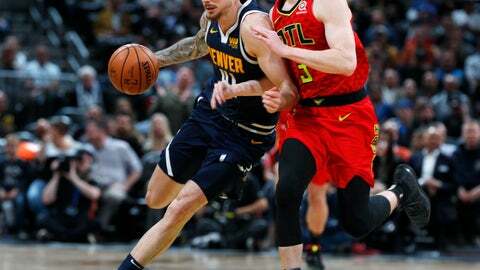 It was the most points scored in the first two quarters this season by the Nuggets, who forced the Hawks into 10 turnovers in that span, eight by steals. Millsap, who spent four seasons with the Hawks before coming to Denver as a free agent two years ago, was at the center of the defensive effort, getting all four of his steals in the first half. The Nuggets surpassed the century mark on a three-point play by Millsap for a 101-68 lead with 3:11 left in the third quarter. By the start of the fourth quarter, the Nuggets were up by 36 points and substituting freely. Hawks: F Taurean Prince was held out of the game because of Achilles tendon soreness. “After shootaround, he just didn’t feel comfortable testing it out tonight, so a night of rest,” Pierce said. Nuggets: The previous high for points in the first half was 68 against the Sacramento Kings on Oct. 23. … The total by Denver was nine points off its season high for a game, 147 against the Los Angeles Clippers on Oct. 17. Hawks: Visit Indiana on Saturday night. Nuggets: Visit New Orleans on Saturday night.